Innovative Safety Systems (ISS) Ltd are celebrating their success in winning the contract to supply vehicle safety equipment to Weymouth & Portland’s new fleet of RCV’s. ISS were chosen to supply the DVR hard-disk recording equipment, based on the quality and longevity of their products, and by offering the best long term package. The six Olympus and two Elite 2 refuse vehicles from Dennis Eagle, procured by the council’s vehicle supply partner, Northampton-based SFS, as part of their ongoing fleet replacement programme, are being phased in over the next few months. All the vehicles will be fully operational by the end July. ISS Ltd is based in Lutterworth, Leicestershire and was set up in 2009 by co-directors, Gavin Thoday and Nicola Thomas, to provide a one-stop shop for vehicle safety equipment supply, maintenance and service. The team has over 30 years combined experience in the waste, recycling and CCTV sectors, and provides an extensive range of vehicle safety products, including DVR systems, reversing radar and warning lights. 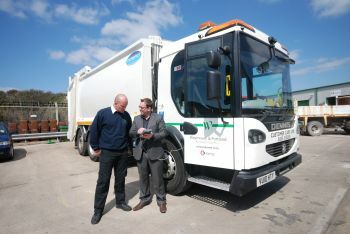 SFS, a leading UK vehicle and plant supplier to the public sector, started working with Weymouth & Portland in 2005 and were subsequently awarded a seven year extension to that contract, forming a partnership until 2016. SFS is one of the UK’s leading specialists in the supply of vehicles and plant on long-term contract hire to central and local government. In addition to its hire and plant fleet that exceeds some 1700 vehicles, increasingly SFS also manages the servicing, maintenance and repair aspects of fleet management.